Roger Ebert drew a lot of heat when he said videogames could never be art. He was wrong, of course, and eventually admitted as much. Every argument he used could have been levied at film a century ago, save one: that videogames require participation, not just passivly experiencing them - the idea apparently being that by not having a single prescribed narrative (i.e., a player's actions change the outcome), then there's no authorial intent and no purposely created "art." That's a crock. Eleanor wants to see the sun. After years of abuse and captivity in the underwater city of Rapture, the troubled genius craves escape - and she has turned to Subject Delta for help. Her connection to him is primal, like that of a devoted daughter despite the tragic origins of their bond. In her eyes, he can do no wrong - but she's no shrinking violet. Like Delta, she becomes a single-minded force of nature when enraged. Interesting phrasing in that bio. In BioShock 2, you play as Subject Delta, a former Big Daddy trying to make his way back to his Little Sister - the now adult Eleanor Lamb. Throughout the game, Lamb is watching you, and by the end, your actions influence the way she behaves. Messiah or murderer, she's only what you raise her to be. Wow, a videogame presenting you with moral choices that have an observable outcome? How... artistic. Sure, it's hung on an FPS framework, but the mechanics of a game have nothing to do with its story, any more than the brand of camera has to do with a movie. Like Mike Krahulik said, "if Bioshock isn't 'art,' then art is the poorer for it." There's already been a mass-market release of Eleanor Lamb, but we're probably not going to review it. Why? "Little Sister, painted white, new head, wearing shoes." There, that's the review of her. She's a great figure, sold in a two-pack with another Little Sister, but having reviewed the mold once, there's not much more to say about her. The SDCC-exclusive Eleanor, however, is something different: namely, she's an adult. The majority of her sculpt is a reuse of the Big Sister sculpt, so for all the details, we'll just point you at that review. The super short version? Highly detailed sculpt, intimidating yet feminine design, and articulation that's good but not perfect. Eleanor isn't a direct copy, however. She has the same big pointy weapons, but she's lacking some of the armor: the pauldrons on the shoulders are absent, and she doesn't have the big tank/cage combo on her back that the normal Big Sisters carry. This isn't just a case of leaving the pieces off - the upper body has been remolded to remove the spots where they attached. So if you turn her around to look at her back, you won't see a giant divot. It's a small change, but an important one, and it's easy to overlook. Also, she's not wearing a helmet. Gone is the Big Sister's metal fishbowl, replaced by a normal human head. She was seen wearing the helmet in the game, but come on, wouldn't you rather have the cool new head? Going for the scenes where she had it off was a smart choice. She looks very accurate to the game, with short brown hair that falls over her large eyes. She has a rather neutral expression, but ends up looking very sad. 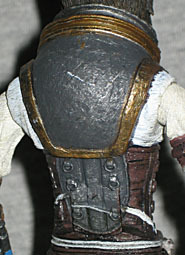 The head is balljointed, but the neck of the suit is painted brown - wouldn't it be white, like the rest of the cloth? Technically she shouldn't have all the leather straps: she just wore the white jumpsuit that goes beneath them, but that would have defeated the purpose of doing a cheap exclusive variant. Eleanor doesn't come by herself: she includes a Little Sister. And yes, it was just three paragraphs ago that we talked about how we'd already reviewed that mold and won't be doing it again, but this isn't just any Little Sister, it's a saved Little Sister! Yes, she's heard the Good Word of Jesus, and repented her si-- sorry, I'm being informed that "saved" in this case just means she's no longer a mindless ADAM-harvesting machine. Dr. Brigid Tenenbaum, the woman who created the Little Sisters in the first place, repented and came up with a way of freeing them, as well. This Little Sister is the same mold as the previous releases, but it's not an identical figure. She's been repainted so she no longer looks like a hideous zombie-baby. Her little blue dress is clean, and her skin is a healthy pink, rather than the unearthly gray it was before. Her eyes are a clear, bright blue, and now you can even make out her sculpted eyelashes. I do wish the paint had been tweaked slightly to make her look like she was smiling, because right now she's a dour little girl. Oh, and if they'd given her Young Eleanor's shod feet, that would have been nice, too. 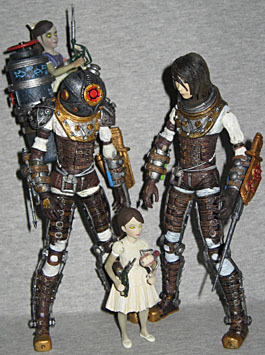 The trailer for BioShock 2 showed something adorable: using what art majors call "found objects" (i.e., whatever garbage was at hand), a Little Sister had fashioned a Big Daddy doll, revealing she was still a real human little girl somewhere inside. It had a baseball for a head, push pins for eyes, etc. NECA has released a prop replica of that doll, but the design changed before the game actually came out: the trailer's doll looked like a Bouncer, while the finished game's needed to represent Delta. The body is the same, and the baseball head, but the face is made by a wristwatch, rather than pushpins. The same accessory came with the Young Eleanor figure, but whether by purpose or design, the paint apps are brighter on this release. The normal release of Eleanor Lamb, as a young Little Sister, is a good toy, and if you're a BioShock fan, you should definitely buy her. But her adult version, dressed as a Big Sister, is a really cool exclusive, and ranks highly on our "perfect exclusive" criteria. The Saved Little Sister is an excellent pack-in, as well, making this set, overall, one of the best of SDCC 2010, and a wonderful addition to your BioShock collection.